Another recent and exciting discovery is the work of artist, Dean Goelz. 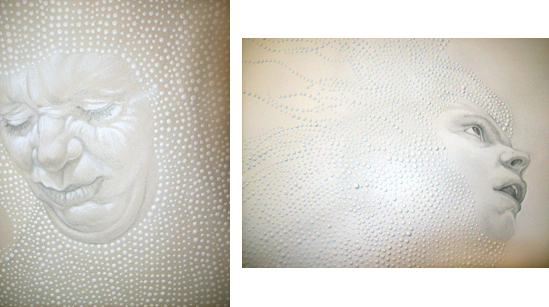 His beautiful "beaded curtain" paintings at the AAFNYC last month really caught my eye. A conversation with the gallerist revealed that he uses a dental tool to create these meticulous pieces, each dot of latex paint placed very carefully and specifically. His work highlights the play between awkward and elegance of existence. It was very tempting to run my hands across them and feel the texture. His drawing skills are impressive (and enviable, too, I might add). The designer in me loves the monochromatic palette. There's something magical and mythological about these paintings. I want to know the stories being told in each one. Find Dean Goelz' work at the Like The Spice Gallery in Williamsburg, Brooklyn. He's part of an upcoming show next week called Marked: A show of Figure.